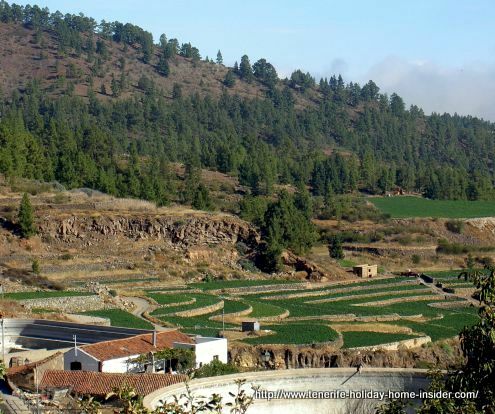 Vilaflor for Tenerife wine tasting excursions and more. Vilaflor the rural pearl of Abona which has several beautiful Haciendas with terraced fields of potatoes, wines and a few other crops dates back to 1496. 1496 was the last year of the Tenerife conquest for Castilla. Then, Pedro Brocamente fell in love with a beautiful Guanche girl whom he dubbed "Vi la Flor de Chasna" (I saw the flower of Chasna). However, Chasna was only added again to Vi la flor the metropolis in 2014. 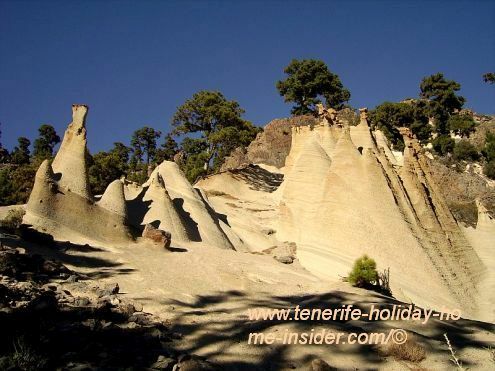 This legendary place of less than 2000 inhabitants isn't only the highest Tenerife town and municipality of the island with 1698m above the ocean, as said by Wikipedia here. It also tops by altitude and unexpected success all Spanish provinces as (DO) wine quality approved designation of origin. Indeed, an important project to produce ecological varieties of Listin White on extremely high slopes has already been awarded with a Madrid gold medal for the wine Flor de Chasna. More attractions of Vilaflor de Chasna. Circular road map F72 including the single track from the main town of Chasna. The grey road the TF 21 goes via Vilaflor all the way to Granadilla de Abona. 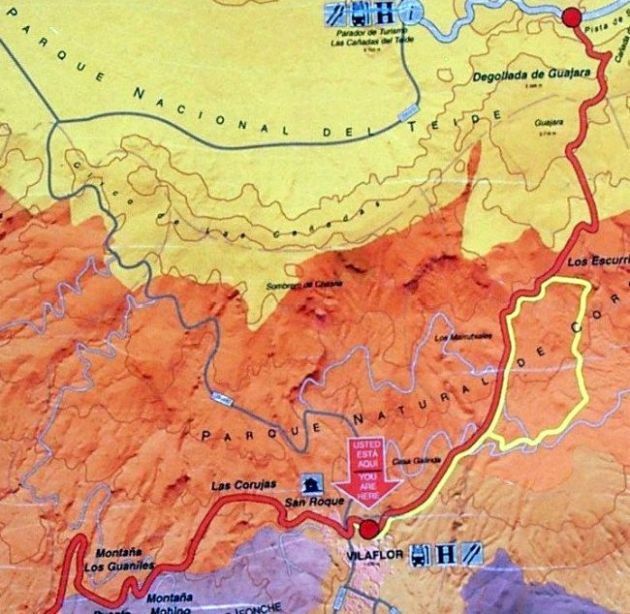 It leads from there via the TF1 by km 54 all the way to the capital Santa Cruz. 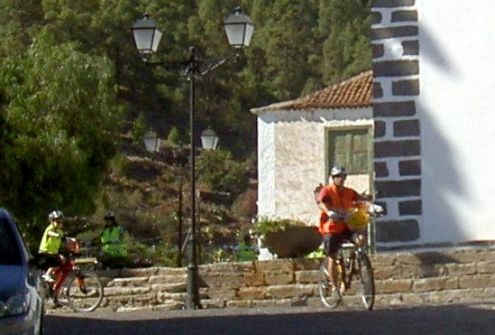 Mountain cyclists by church Santiago Apostol to proceed to Arona. The gray road the TF 21 from Boca de Tauce down South is for cars, while the red one over the Pass Degollada de Guajara is a nature trail for mountain cyclists and pedestrians. 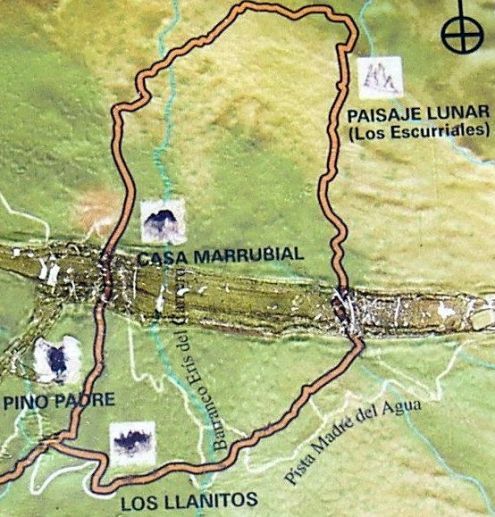 This so called GR 131 a part of the ancient Camino Real from La Laguna is physically blocked for vehicles at some stage near the Paisaje Lunar. Hence, no point to even try a way around. 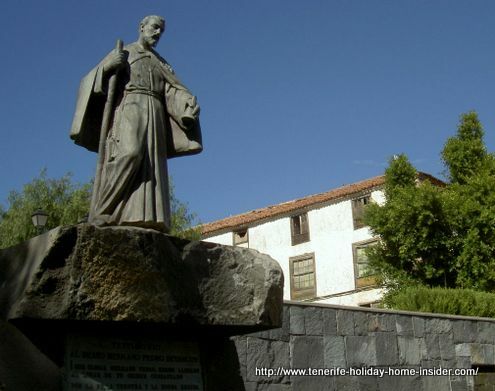 The only Tenerife Saint a native from Vilaflor. 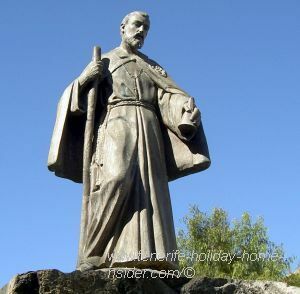 The lay friar Brother Joseph de Bethancur who had emigrated to Guatemala City in his early twenties spent his life there educating and helping the poor for free. The order of the Bethlehemites that he founded joined him in his noble task until he died at age 42 in 1667. The Saint's goat shelter cave from his youth which is by El Medano is now a place of pilgrimage in April every year. The sanctuary of Brother Joseph the Saint behind the church. 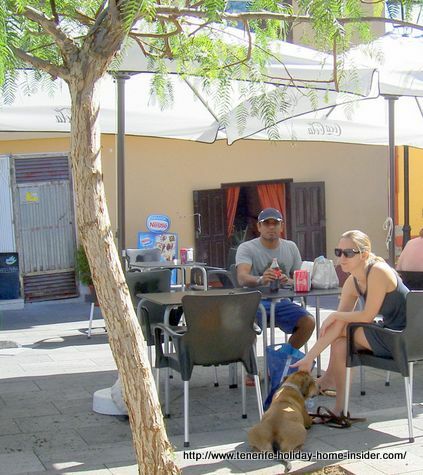 The photo of this street restaurant opposite the Hermano Pedro Fountain was taken by the Tenerife holiday home insider. It depicts her dog Jesse together with her daughter and son in Law. 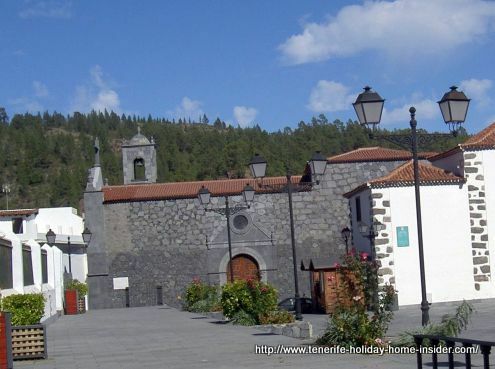 In fact there, she learned much about the highest town of Tenerife of Chasna and its Saint. Restaurante Fuente Hermano Pedro of Vilaflor de Chasna. Much is also displayed there on plaques by the fountain at the end of the small park. 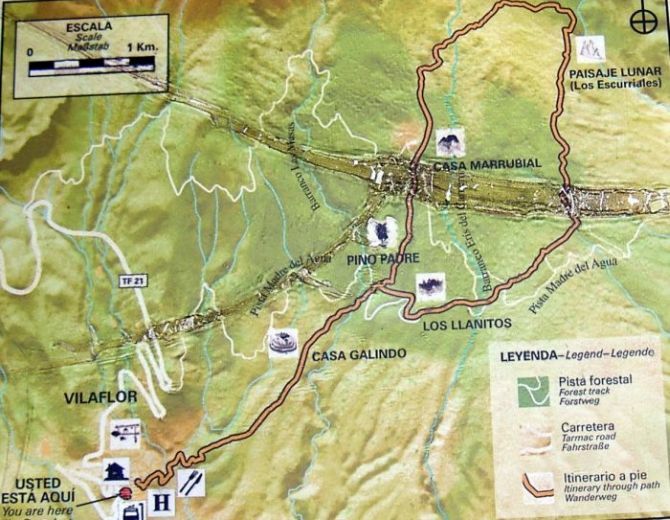 It also encouraged to collect more material about the legendary trail to the Paisaje Lunar at the town hall beside the restaurant. The maps for getting around from this main Chasna town were on sign posts. Unfortunately, they may not render big enough on smart phones. How was food at this dog friendly restaurant by the town hall? Our lunch was simple but excellent. We had grilled Sardines, Mojo sauces, Wrinkled potatoes, Spanish Tortilla Omelette, French Fries and a Bocadillo Sandwich. Everything including drinks came to less than Euro 25. This included a few non alcoholic drinks. Service was not fast but we very much enjoyed sitting in filtered sun without traffic noise nearby. By the way, this street restaurant Fuente Hermano Pedro advertised for craft works which were sold inside. A fast stroll around the neighborhood. I went to explore a little up and down the road while my companions relaxed and waited for the food. 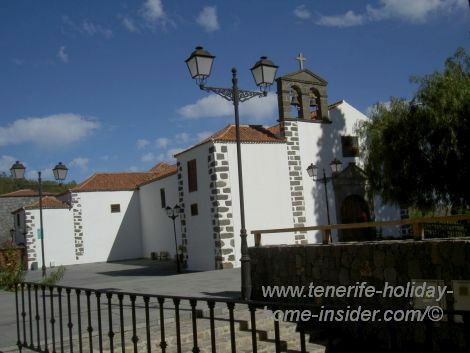 Next to the church behind the small fountain park was a beautiful, typical Tenerife house. It was ancient but in good condition. It had a for sale sign attached. It was the Casa de los Soler. Casa de los Soler a haunted house from way back. A descendant of the Soler was murdered there. His ghost was spotted some time later. They say that nobody ever investigated the crime. This is food for thought. This restaurant is about 30 or 50 meters down the road from where we took our break. I was so taken by a glimpse of a wine covered terrace at the end of the Casa Pana corridor that i walked straight ahead inside. View to terrace with vines of Casa Pana. I landed in a kitchen first and had a very rude awakening. No, I had not seen the sign that pointed to turn to the right. 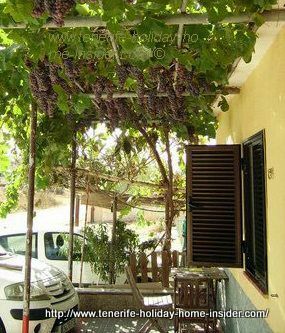 Back I went to deviate and arrived at a terrace with vines overhead above rustic seating. Vines of Abona right in the town of the Flor de Chasna at the back end of Restaurant Casa Pana. 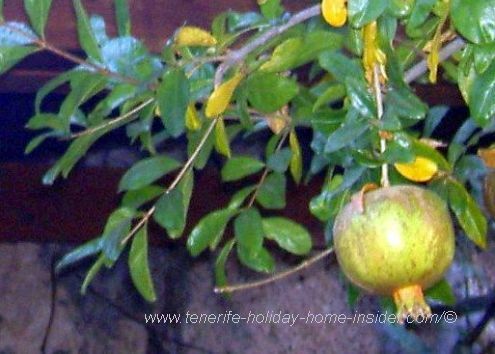 A ripe Pomegranade overhead on a climber in the veranda corner of Casa Pana. Then, my gaze was drawn from the balustrade over beautiful green fields to a pine forest on the horizon. It's the picture at the start of this article with the gigantic rain water tank in the front. I had to check on our lunch by the Plaza but, was glad we never went to Casa Pan. There, our dog surely would not have been welcome. I showed this restaurant to my folks later on and we noticed that it wasn't cheap at all. A short trip to Ifonche where you eat below grapes. Tasca Taguara at Ifonche on the road to Arona. Abona grapes at Ifonche that grow right above you where you are eating at the Tasca Taguara. Ask for the economical grilled or oven baked Conejo. Where sleep in the birth place of brother Peter? Casa Zaguan in Calle Castaños was mentioned with the photo of the fountain of the saint. 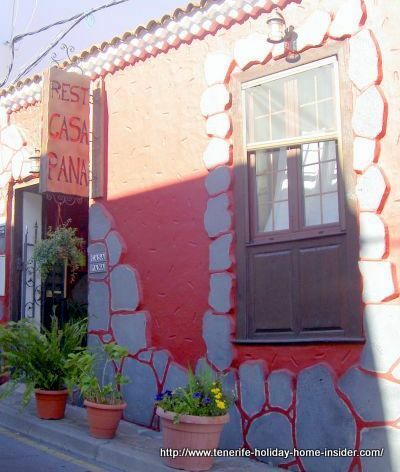 There is also Casa Germán which is said to be cheap. A Spa Hotel with mineral waters is a little outside of town. 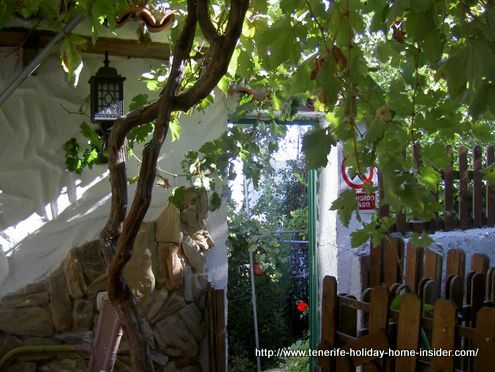 Some holiday home apartments for self catering as well as three or four more smaller hotels are around. 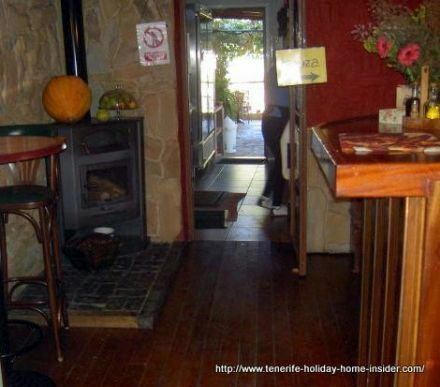 Prices range from about Euro 30/night to Euro 100/night. There is no camping ground nearby. Jable Vineyards of the Abona region. 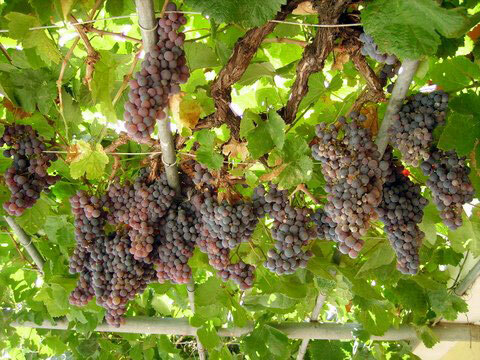 16 are listed for Mountain wines with Abona quality designated origin (DO). By the way, Jables allow for good drainage. They are a mix of the porous volcanic material and normal soil. The wine Pagos de Reverón of Abona by Vilaflor made Silver during the nomination of best wines of Spain at the International Ceremony Bacchus 2018 on March 8-12 in Madrid. A vineyard excursion and more. This so called ecological vineyard has more than 36000 grape vines which produce 200 000 kg/a year on a 40 000 m2 terrain. From Vilaflor back to Tenerife towns.